The Last Unicorn comic adaptation #2 (review for #1) arrived at my door last week, and despite being exhausted I had to squeeze it in before falling asleep that night, in part because this is the issue that I can’t help but think of as “Meet Schmendrick,” and what self-respecting fan could resist the tawdry horrors of Mommy Fortuna’s carnival, to boot? 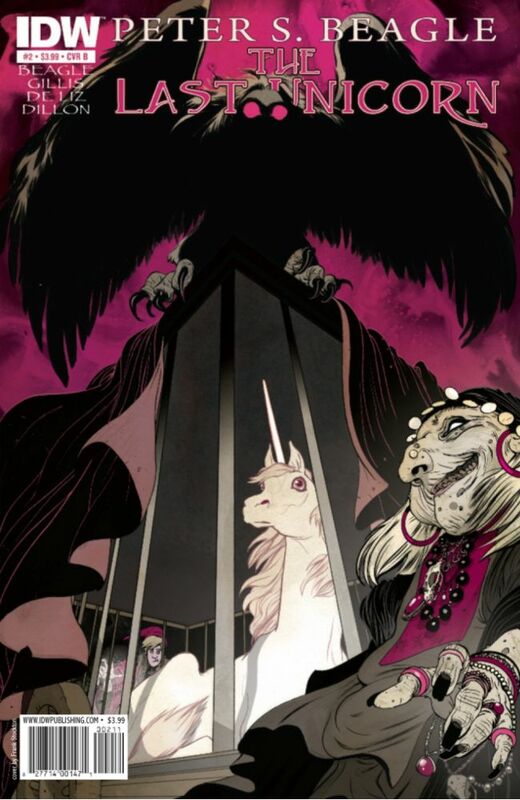 In this issue, the unicorn wakes to find herself imprisoned in a two-bit witch’s menagerie of illusory monsters, and her best chances for escape lie with a well-meaning but inept magician named Schmendrick. While I love his graphical approach, and particularly liked his cover variant for the first issue, it irks me that his unicorn tends to look kind of witless, and on principle I have trouble condoning the idea of a unicorn having “the hair of a Hollywood starlet.” Also, I really, really loved the de Liz/Dillon cover design for this issue. But life goes on, and Mommy Fortuna’s hand looks awesome here. Basically, everything that I liked about the first issue I liked just as much, if not more, here: atmospheric color choices, expressive human characters, effective panel layouts, and pretty much pitch-perfect adaptation of the text. 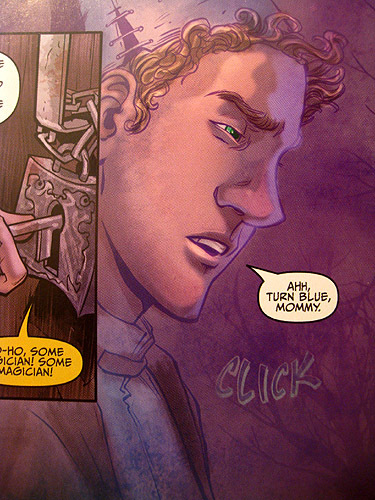 Very occasionally I was still bothered by coloring choices, but I found the use of textures much less obtrusive in this issue than in the first, and particularly effective in conveying the murk and grime of Mommy Fortuna’s carnival. There were also a couple of mostly-wordless compressions of action and narration that made me go YESSS, that could not have been done in any medium other than comics. Character interpretations! De Liz’s Mommy Fortuna is actually borderline terrifying, with deepset eyes (one of them glaring and cataracted), chubby beringed fingers, a leer that reminds me (appropriately) of Angela Lansbury in Sweeney Todd, and purplish, spongy-looking flesh. 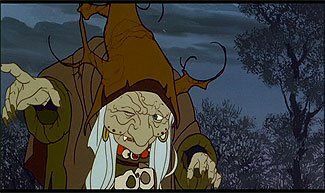 Somehow she manages to make me much more uncomfortable than the animated version did. I think it’s the spongy, spotty decrepitude that gets to me. Movie-version Mommy is really kind of badass, but comic-version looks like she’s just completely let herself go, and is reaping every ounce of ghoulish pleasure from looking as awful as she possibly can – which makes perfect sense for her character. 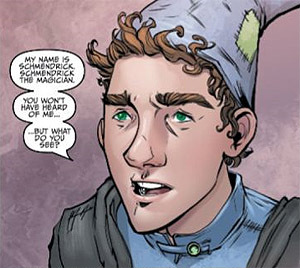 And – the big moment for me, since I’ve come to love this character in his absurdity and vulnerability more and more with time – Schmendrick. 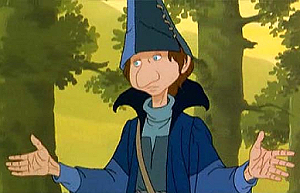 I know Molly Grue is the big one for most people (or at least that’s my assumption), but Molly is fearless and strong in a way that I’m not, so that while I love and admire her character, I end up identifying with Schmendrick. …the other was a tall, thin man with an air of resolute bewilderment. He wore an old black cloak, and his eyes were green. He smiled, and she saw that his face was frighteningly young for a grown man – untraveled by time, unvisited by grief or wisdom. He’s woeful and lovable in a potato-nosed, Precious-Moments-head-stuck-on-a-beanpole-body kind of way. My heart may or may not have skipped a beat when I first saw this panel. De Liz’s Schmendrick looks like he could be anywhere between sixteen and twenty-six; he has large, frequently furrowed brows; he has long fingers with knobby knuckles; he’s given to flashing grins that you suspect he doesn’t really feel, and making grandiose gestures that read as half habitual self-parody, and half the last refuge for an utterly battered ego and self-doubting soul. Basically, he’s perfect, and I couldn’t be more grateful to see such a loving, sensitive rendering of his character. Reading this issue made me realize how much I love to see the unicorn and Schmendrick in action together, because the mixing of their respective registers heightens both: the unicorn’s immovable calm (even when she’s in distress, she’s elegant) is the perfect foil to Schmendrick’s tragicomic bluster and endlessly flickering emotions. “You deserve the services of a great wizard,” he said to the unicorn, “but I’m afraid you’ll have to be glad of the aid of a second-rate pickpocket.” […] Schmendrick was already fitting a key into the snickering lock. At his first attempt, which failed, the lock fell silent, but when he tried another key it cried out loudly, “Ho-ho, some magician! Some magician!” It had Mommy Fortuna’s voice. I love everything about this panel, from lighting to – most of all – expression. Can’t wait for the next issue now.